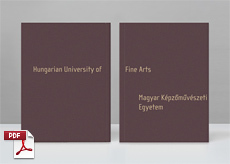 To apply as a Guest Student at the HUFA, you must be the student of an institution of higher education in art or have sufficient academic background in the visual arts (more specifically, in the discipline for which you are applying), so that you will be able to join the rigorous academic program in progress at the HUFA. As a Guest Student, you can study at the HUFA for a semester to an academic year and can receive credit points for your work within the ECTS system, which you then may be able to transfer toward earning a degree at your home institution (depending on the specifications of the given institution). Please note, however, that as a Guest Student, you cannot earn a degree from the HUFA – this option is only open to Regular Students (please see below). a letter from the school that you are attending, attesting to the fact that you are currently enrolled there, or, if you have already graduated from an institution of higher education in art, a copy of the diploma certificate. If your first language is not English you must be able to prove that your spoken and written command of the language is adequate for the program. If you haven’t obtained a certificate from the list above, your ability to use and understand English at the university level is going to be tested. If you wish to earn a degree at the HUFA, fluency in the Hungarian language is required, and you must go through the same standard entrance examination process as any Hungarian applicant would. For information on the entrance examination process, click here. If you have further questions about the entrance examination, please contact the Registrar’s Office directly at: pongo.istvanne@mke.hu or +36 1 351 7956. The basic university training comprises 5 academic years (10 terms). Students may start to specialize in teaching secondary-school artistic drawing, art history and projective geometry at the beginning of the 4th academic year.